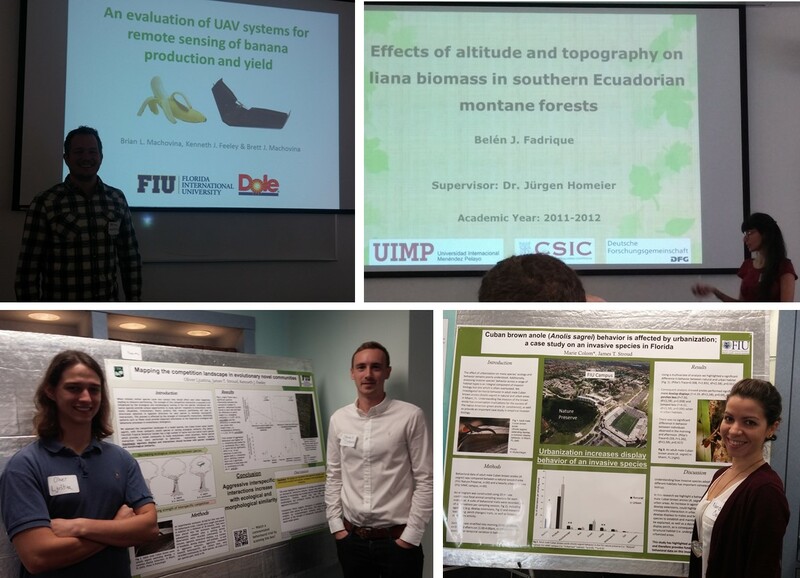 The upwithclimate team was well represented at the 2015 FIU graduate student symposium. Lianas are structural parasites that rely on tree support for reaching the canopy. Lianas strongly affect forest dynamics, causing increased mortality and decreased growth of host trees. Their density and biomass have recently increased in neotropical lowland forests, however, their status in tropical montane forests remains unknown. The aim of the project was to define liana distribution patterns along elevation and topographical gradients of tropical montane forests. I studied the liana-host tree interaction and I compared liana biomass contribution among elevations and with lowland forest. My final goal was to identify other potential factors affecting liana biomass, such as soil composition or forest structure. This project was carried out in the tropical montane forests located in and around Podocarpus National Park in South Ecuador. All lianas (dbh ≥ 1cm) and trees (dbh>10cm) were recorded in 54 permanent plots (400 m2) at three study sites (1000, 2000 and 3000masl) with three topographic positions (low, mid, upslope). As results I found that liana biomass decreases with elevation and its contribution to total biomass is lower than in lowland forests. Elevation, stand structural parameters and soil conditions, pH and nitrogen, were identified as the factors determining liana biomass patterns on the studied montane forests. UAVs remain largely untested in tropical agricultural systems. In this study we compared the ease of use and efficiency of rotary-wing and fixed-wing UAV systems equipped with two different sensor systems for mapping spatial patterns of photosynthetic activity in banana plantations in Costa Rica. Spatial patterns of a photosynthetic indices based on reflected red/red edge and visible light (ENDVI) and reflected near infrared and red light (NDVI) were then compared to spatial patterns of physical soil quality, irrigation activity, and banana fruit production data. We found that the rotary UAV system was easier and safer to operate but that the fixed-wing UAV system was more efficient in areal coverage and extent of imagery acquired per unit time. Spatial patterns of ENDVI and NDVI were significantly positively correlated with several metrics of fruit yield and quality. Irrigating bananas during early stage growth significantly increased both ENDVI and canopy cover. Spatial patterns of NDVI were not correlated to spatial patterns of physical soil quality. These results indicate that UAV systems can be used in banana plantations to help map patterns of fruit production as well as some of the underlying drivers of production, thereby helping to maximize agricultural efficiency. Biotic interactions are often assumed to be an important factor in structuring ecological communities, and a driving force behind subsequent phenotypic evolution of constituent species. In multiple independent adaptive radiations of Anolis lizards on islands in the Greater Antilles, biotic interactions are assumed to have been integral in influencing the patterns of diversification. In south Florida, a suite of evolutionary novel communities of Anolis lizards from the Greater Antilles have been formed through multiple introductions of non-native, formerly allopatric species. We assessed the competition landscape of sympatric Anolis or one focal species, the Cuban brown anole (A. sagrei), using staged experimental trials of paired species interactions. Three sympatric Anolis species were chosen which represent a gradient of ecological similarity. We hypothesised that agonistic interactions would be highest against species of highest ecological similarity. The effect of urbanization on many species’ ecology and behavior remains poorly understood. Additionally, assessing invasive species’ behavior across a range of habitat types is an integral component of invasion biology but one which is often overlooked. We investigated territorial behavior in adult male Cuban brown anoles (Anolis sagrei) in natural and urban areas in Miami FL. Behavioral traits were categorized into territorial (head bobs, dewlap extensions, push-ups), movement (run, jump, perch change) and individual (copulating, eating) groups. There was a significant difference in behavior between natural and urban habitat (MANOVA, df=8, p=0.01). Specifically, anoles performed more dewlap displays (df=1, p=0.04), changed perches less (df=1, p=0.008) and jumped less (df=1, p=0.006) when in urban habitats. There was no significant difference in behavior between morning and afternoon sampling observations (MANOVA, df=8, p=0.3168). Dewlap displays are typically a territory-maintenance behavior, therefore an increase in urban areas could represent heightened intrapspecific competition. Decreases in perch changes and jumping could be due to a decrease in structural habitat complexity with an increase in urbanization. This research highlights the need for further research on the ecological consequences of urbanization on Cuban brown anoles.